Delegates came from 23 different organisations of varying sizes and with different levels of understanding and stages of evaluation and impact application. The class kicked off with introductions where each organisation told the group “Why?” they exist. A question more challenging than perceived at first glance which, for some delegates, was the single most valuable learning point: “To think about Mission as The Why – a very simple way to think about it and keep on track”. We discussed the myriad of sources of evidence that they were collecting and asked what they did with these. Everyone was working so hard on the collection of evidence and a few offered to say how relieved and pleased they were with Esmee Fairbairn Foundation’s revised approach to asking for evidence and evaluation. They saw this as a refreshing step forward by a funder allowing them to focus on planning and delivery. Each organisation had different challenges and what they did with their evidence varied considerably. “Not enough” was a recurring response, appreciating that they needed to re-address the balance of time between collection, reporting and the value added. We discussed in detail how measures that to them seem worthless but are required by their funders or supporters can be viewed through various lenses and communicated to more audiences thus rendering them far more useful. 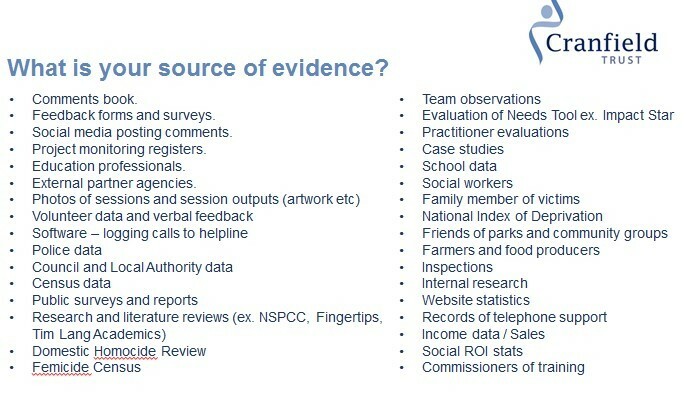 “we do have metrics but want to check (a) does it tell us what we actually want to know (b) can we use any collected but not used data to tell different stories"
Time is the greatest resource in all organisations and most precious in our charities. The class focussed on using measures to continuously strive for improvements and how this cyclical process of measuring, feeding back, celebrating and coaching towards better performance could weave evaluation into the heart of the organisation, in this way becoming a necessary task rather than an irritating chore. The class followed the stages of a continuous performance improvement cycle, showing how this methodology, when applied across the organisational functions and projects could help contextualise impact and evaluation. 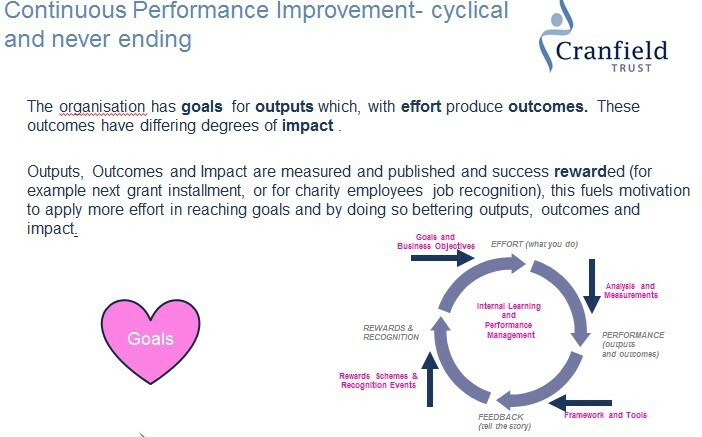 We discussed how the collection of evidence is everyone’s job and how critical to success is sponsorship from the Board, CEO and senior management team, without this the performance improvement cycle will slow to a halt. We discussed how goals and targets are sponsored from the top but delivered bottom up and how evaluation data at different levels needs to support these overall targets. The Force Field Analysis proved a useful tool to help decision making and setting targets. A lively debate and sharing of ideas followed, around how best to communicate evaluation and impact data acknowledging the importance of stakeholder analysis and meeting requirements for both quantitative and qualitative data. 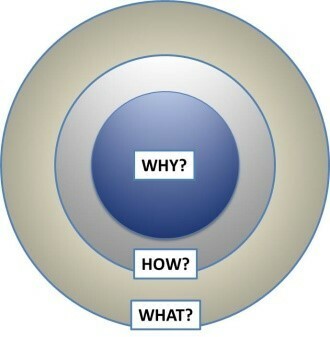 I will use the 'Why' as a starting point to think about our Mission when next reviewing business plan with the board and staff. The masterclass confirms steps I have been making to consolidate more consistent evaluations across the Festival's community programme. Write feedback forms for our volunteers and give them feedback on their hours, projects and work achieved ....perhaps in pie chart form. Think more outside the box when looking at qualitative measures. From the same evidence use different scenarios for dissemination. I will develop clearer targets so that we all know how we are doing. 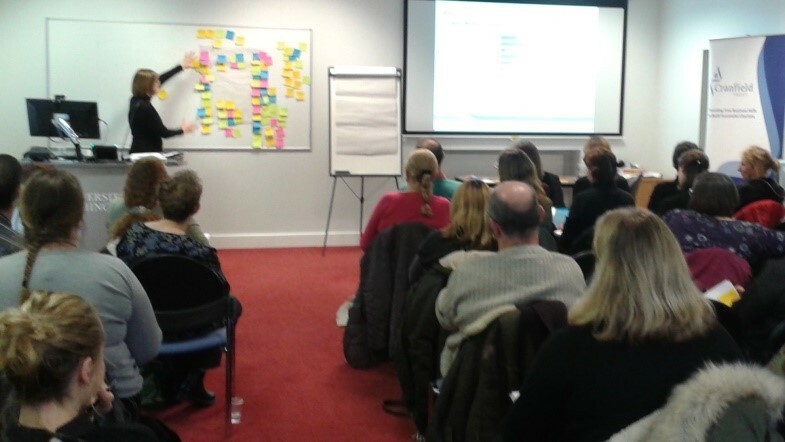 Learning was useful and will be used to improve our assessment processes. I have already applied to Cranfield Trust both for the HR support and for the consultancy service and e-mailed three other people who I networked with at the meeting re partnerships. I have talked with my team about the importance of building partnerships with our funders. I am going to feedback to my team about the masterclass at our team meeting next week and I have some proposals about building in some regular feedback from clients about the most significant change for them at the end of each session. It further developed my knowledge and understanding of measuring impact and has prompted me to review the data we collect and how it is used. It will definitely shape the way we decide what data we decide to gather. I think we might like to apply to the Cranfield Trust for some support to help us put an evaluation strategy into place for our new model of working. I will potentially use some of the tools and some of the creative ideas for collecting data. I will pilot the measurement of themes on my project and then share findings with the team. I will also explore the appetite for developing strategy within the organisation. We are readdressing our WHY to reflect changes in our first two years We will look at what we gather and make better use of it - reassessing each aspect of our different projects and look at what information would benefit the development of them and the organisation as a whole. This valuable masterclass was made possible thanks to the kind support of the Esmee Fairbairn Foundation. 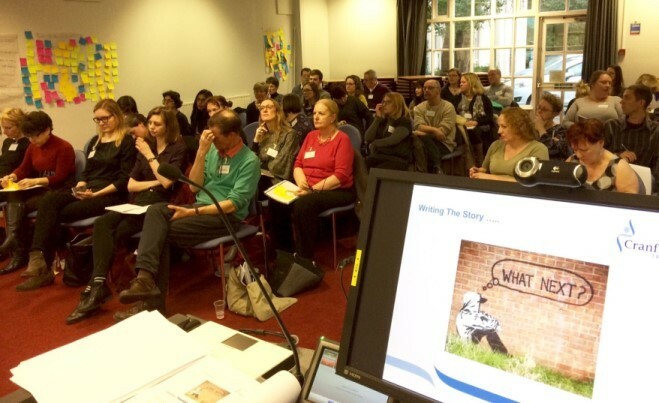 Blog by Alice Dabrowska, Head of Consultancy, Cranfield Trust. Be the first to hear about our masterclasses by following us on Twitter @CranfieldTrust.